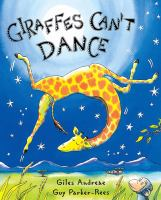 Copies of Giraffes Can’t Dance by Giles Andreae and Guy Parker-Rees are available to all 4-year-old children at Mesa County Libraries between April 11 and 25, 2016. “Giraffes Can’t Dance” is this year’s selection for the One Book 4 Colorado program, an annual statewide effort now in its fifth year that distributes 75,000 copies of the selected book to 4-year-olds throughout Colorado. Mesa County Libraries typically distribute as many as 3,000 copies of the One Book 4 Colorado selection. Four-year-old children in Mesa County may pick up their books at no charge from any Mesa County Libraries location beginning April 11. English and Spanish copies of the book are available. Private donors provide the funds for the One Book 4 Colorado Program, and Lt. Governor Joe Garcia’s Office along with the Colorado Office of Early Literacy, Colorado State Library, the Denver Preschool Program, public and military libraries statewide, the private sector, and the nonprofit and foundation communities put it in motion.